I have been feeling burnt out for a while now. Jumping at any opportunity that takes me away from my kids and my house. One of the main causes of burnout, Rabbi Nivin taught us, is lack of authenticity. For example, when a former rock-band member becomes a baal teshuva and trades in his guitar-playing for all-day gemara learning. Or a marathon runner who becomes a mom and trades in her running shoes for playgroups and diapers. Burnout comes, Rabbi Nivin says, when we feed our higher soul but starve our lower soul. When we feed that idealistic part of ourselves that wants to learn Torah and raise a Jewish family and serve Hashem but starve that equally crucial part of our souls that needs to experience pleasure right now. This morning at Devora’s Dance Journey workshop, we explored this tension between our higher soul and lower soul, between Heaven and Earth, through the sense of smell, the sense associated with this Hebrew month, Cheshvan. Devora started off by asking us to remember a smell we loved when we were children. 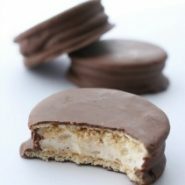 And out of the blue, I remembered a smell I haven’t smelled in several decades…As a kid, when I would come home tired after a long day at school, I would puff up a moon pie in the microwave, and I would eat it while vegging out in front of Oprah. So this morning, I smelled the smell of microwaved marshmallow, melted chocolate, toasted graham cracker. I danced around and smiled big and smelled that smell as though I was again sitting again in front of Oprah, licking the melted chocolate off the tines of my fork, lower soul Heaven. And then Devora took down something from her bookshelf that looked like a menorah which held small vials instead of candles. And she told us that these vials contained the spices which made up the original ketoret, the incense used in the Holy Temple 2000 years ago. She told us to choose one of the vials and breathe in its smell, and to imagine that smell filling every cell in our bodies. I chose out the spice called Kalufa, and when I screwed off its top, I discovered that it was one of the most delicious smells I ever smelled. Intense cinnamon with a gentle touch of vanilla. And I smelled the incense and danced around and imagined that I had snuck into the Beit HaMikdash and somehow had it all to myself, smelling the Ketoret and sacrifices mixing together as I swirled around, Hashem right there with me in that ancient meeting place of seamless connection between G-d and Jew. Devora finished off her class by having us dance Heaven and Earth, switching back and forth, between the dance of the higher soul and dance of the lower soul. And for me, I danced the dance of microwaved moon pies and Temple incense, finding just the right balance to feel alive and whole. So how does Rabbi Nivin advise that we bridge the dichotomy? he advises we learn how to feed our lower souls. by doing the things that bring us pleasure—for one woman it might be getting a massage, for another reading a magazine, for another going to the gym, etc etc. I so resonate with this. Thanks for sharing. Authenticity is also when we do things that we’d really rather not, because we think we have to, like a mother who feels she has to play Lego for hours rather than read a book….Its finding the balance between what we really want to do and our obligations, both inside and outside the home.